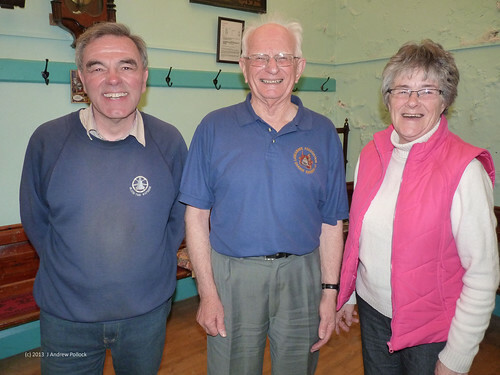 This gallery presents a selection of photographs from the Furness & South Lakeland Branch LACR Open Days held on 4th and 6th of May 2013. The following images are reduced, with larger (1500x1200) copies of the originals available (by clicking on photo) on Flickr. Click on image above to view the extended gallery with descriptions. 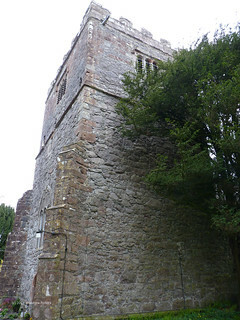 Click image to begin playing embedded slideshow above (small). Move cursor over slideshow to reveal slideshow controls. Move cursor away from slideshow to hide slideshow controls. 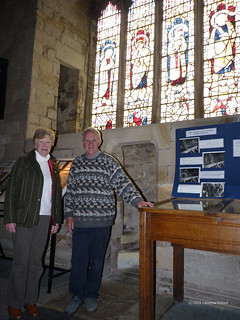 Selection of photos from the full gallery Click on photograph to open larger image on Flickr in a new tab. 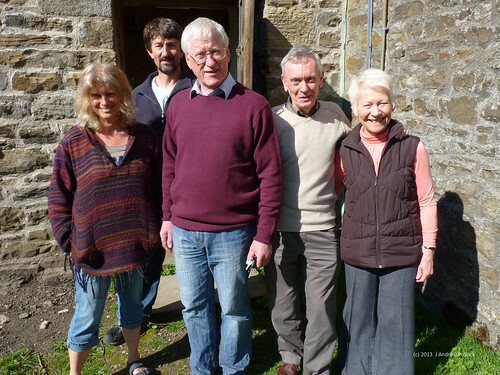 The Open Days narrative written by Andy Pollock (organiser of the open days event) and appears between photographs. The open days took a great deal more preparation than the previous Branch Open Day held on Mon 26th May 1997! 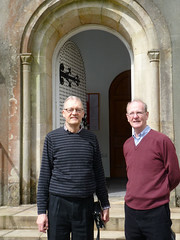 The open weekend ran smoothly from start to finish. 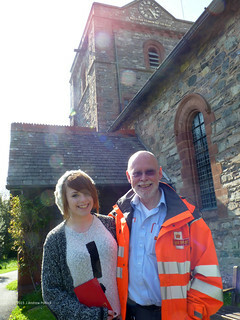 It nearly began badly, when I found Bowness churchyard gate locked! Fortunately, Mike’s timely arrival rescued me from my predicament, and allowed me to set up stall in time! 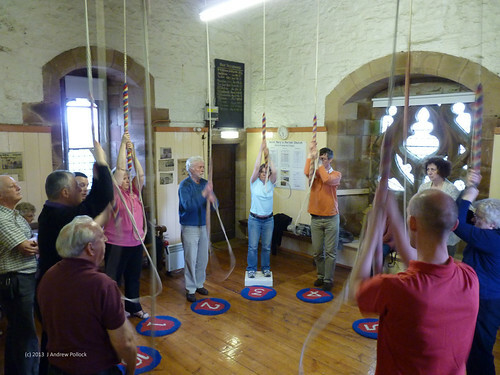 Over the next half an hour I was pleased to meet ringers who had come from as far as Maidstone in Kent (over 300 miles away) and sold another 20 passes which settled my nerves. 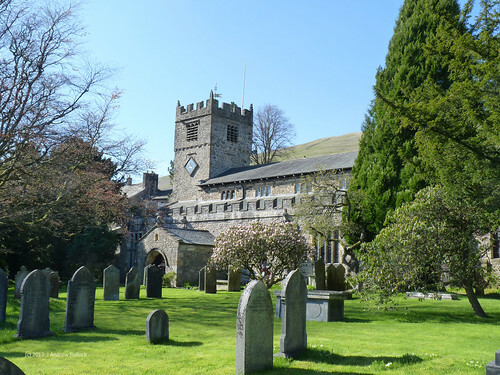 I was slightly puzzled by a few ringers who purchased day or weekend passes, but then declined to ‘grab’ Bowness bells while they were there. 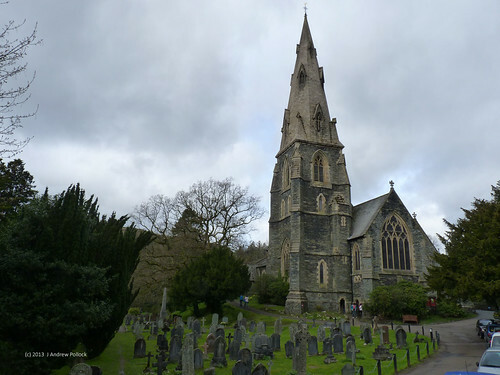 I can only assume they didn't want to miss any time at Ambleside with its 32&half; hundredweight tenor. And so began the great adventure. 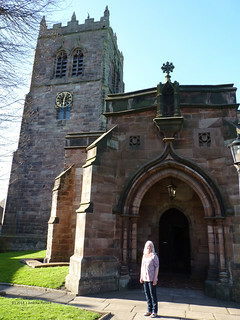 I was on a personal mission to visit every tower, thank everyone for helping out, and take photographs that Keith might use in the branch newsletter. 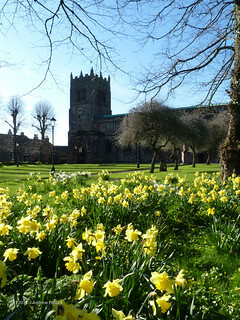 I hoped I might even get a ring at a few towers. 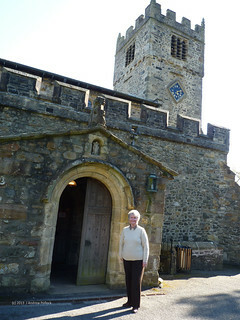 There was a great sense of teamwork and a positive buzz/vive at every tower from the fabulous volunteers, and touring visitors alike; all enhanced by the warm spring sunshine that I had ordered! 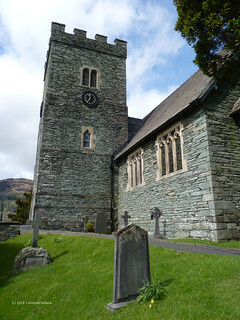 Some well struck ringing could be heard at Ambleside, and the bells sound fabulous as always. 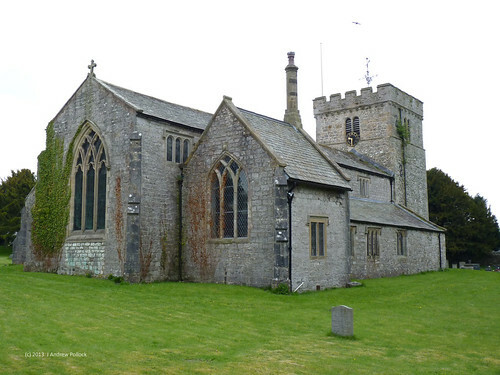 It was a pity for one ringer (from near Bradford) that he arrived just after the final ring. 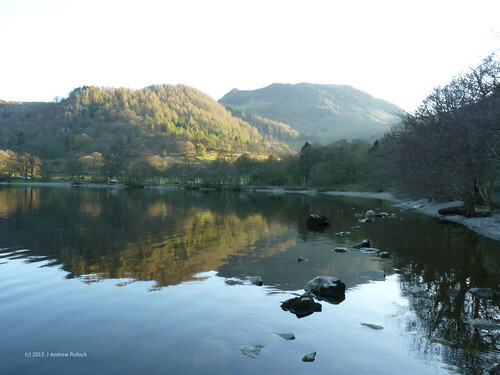 It transpired that he was using an early timetable that he had printed before Brathay and Ambleside had swapped to accommodate Ambleside choir practice! 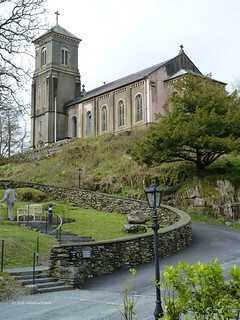 St Mary's Parish Church, Ambleside with 4th heaviest ring of 8 bells in UK. Brathay had been transformed since my last visit over a decade ago (to my shame!) 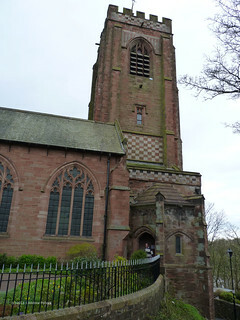 with car park, landscaping, and similarly excellent improvements to the tower and bells. 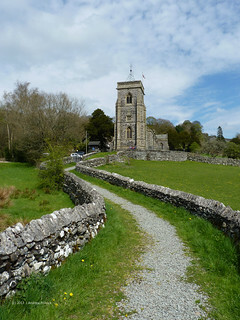 at Holy Trinity church, Brathay. 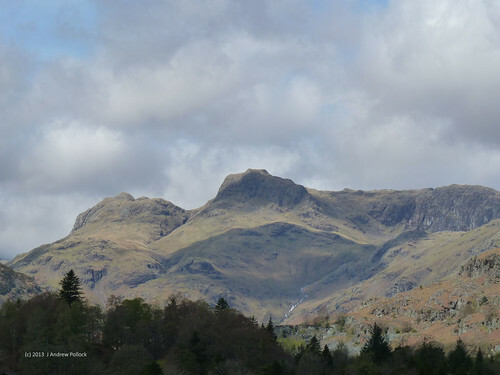 The dramatic Langdale valley and Harrisons Stickle was as inspiring as ever on the way to Chapel Stile, and I grabbed a rope to make up the numbers at the end of the session, and was pleased to see one of the younger visitors make a good attempt at plain hunting. 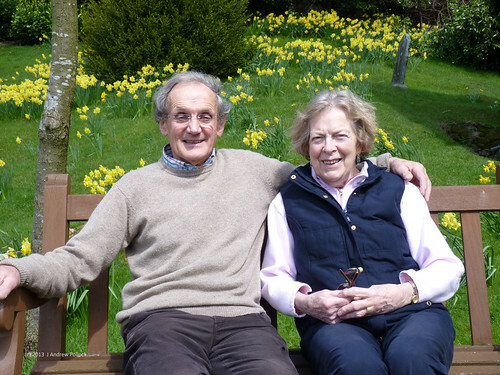 Graham and Kay Stirrup amongst daffodils in Langdale churchyard. 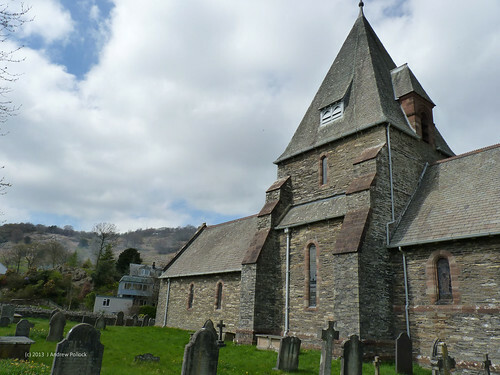 On to Hawkshead where the ringing overran into the lunch break by a few minutes to give the local band a chance to plain hunt on 4. 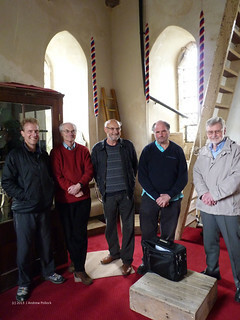 John Gunner, Edward Dixon, Clive Sutton and Mike Maxwell at Hawkshead. 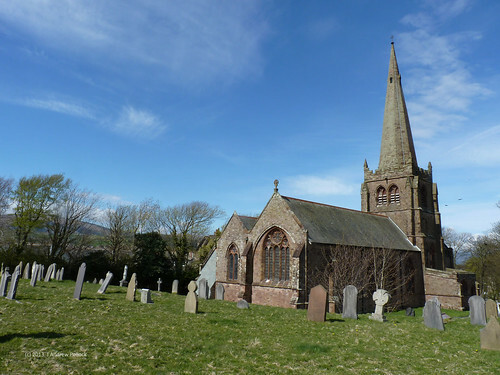 Time was pressing, and even with a relatively clear road, I arrived late at Millom. I arrived with 45 minutes of the lunchtime remaining. Jonny brilliantly leapt in to the fray and made sandwiches while I served tea/coffee cakes along with Jonny’s legendary pies. The lunch went well and made quite a healthy sum. 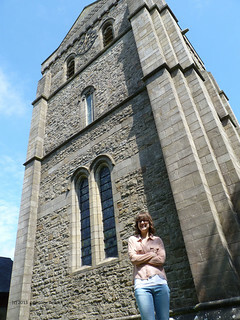 The afternoon seemed to flash by as the open day explored Furness towers. 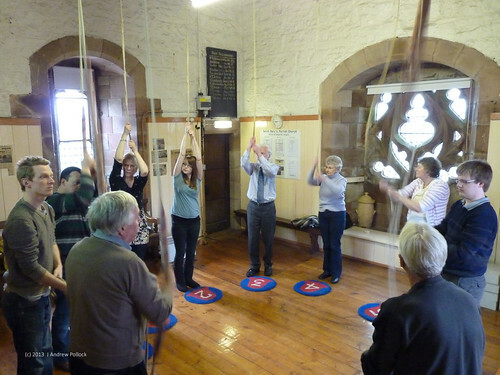 Tom Metcalfe showed off Kirkby bells which were very popular - several comments overheard about how sweetly they rang (and it was a pity they couldn't take them home!). 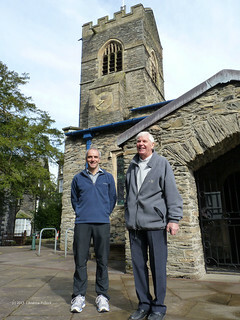 A broken crown staple in the tenor at Ulverston threatened to reduce them to a ring of 5 for the open day! 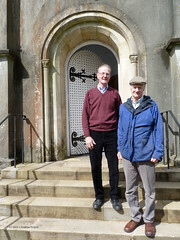 They were not to be denied - Whitechapel fixed and returned it just in time for Ian and Hugh to fit it the day before the Open day. 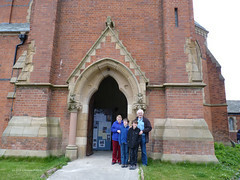 Like many other towers, a host of people had pulled together to handle tickets, and provide refreshments and ringing support! 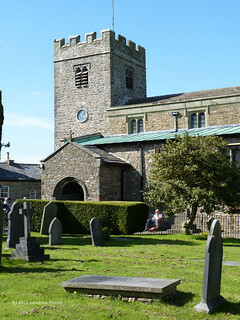 Great Urswick has just 4 bells but this did not discourage many visitors. 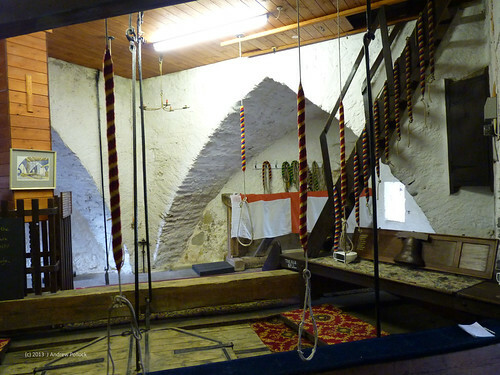 Visitors and locals will be pleased to know that Tom Metcalfe is working toward augmenting them to a ring of 6 bells in the near future. 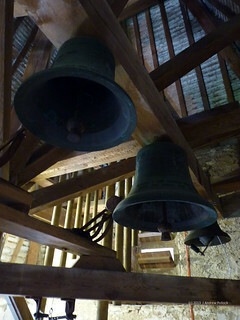 They should have great potential as a ring of 6 bells. 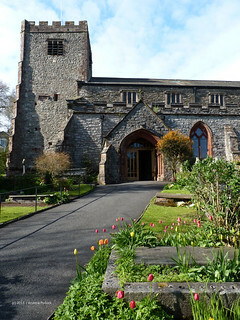 The 10 bells at St Mary, Dalton-in-Furness were the last of the day that could be rung properly (most of Barrow's bells being out-of-action), and they sounded very fine indeed. 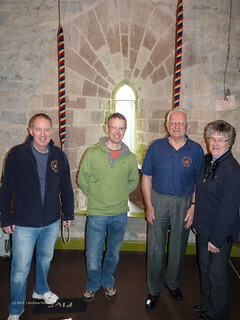 Carl, Stan and visitors enjoying ringing on 10 bells at St Mary, Dalton-in-Furness. with Andy Pollock & sons. 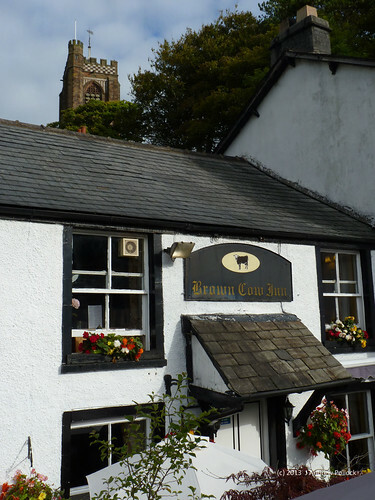 The day was not at an end yet... Andy Pollock and family went along to the Brown Cow in Dalton for an excellent meal, and chatted to the group from Lincolnshire who joined us there for the meal. 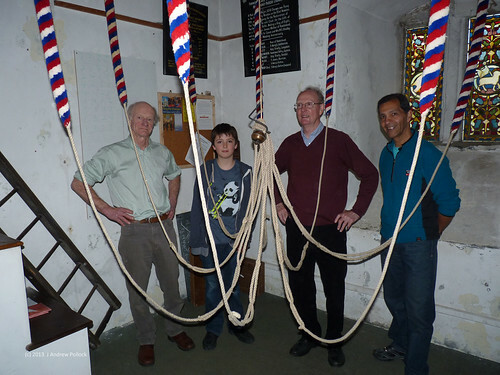 Sunday was the day-off in the programme, though there were opportunities for visiting ringers to go and join locals for service ringing. 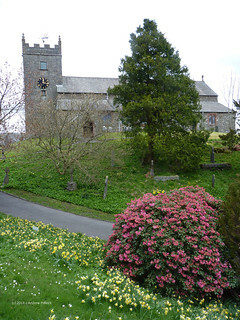 I am not sure about elsewhere, but I was pleased and grateful that some of the Kendal ringers were able to support a couple of visitors to ring for service at Burton-in-Kendal. 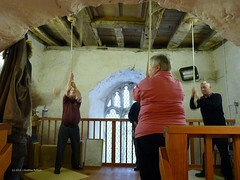 Burton doesn’t even have their own band for practice, and are certainly not accustomed to Sunday service ringing. 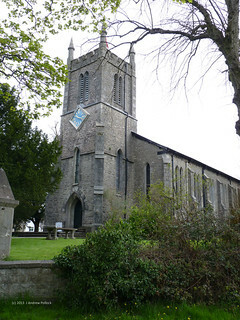 This was evident when we turned up on Monday morning to be welcomed by churchwardens and other locals enthusiastically talking about how wonderful it was to be called to service by the bells the day before. 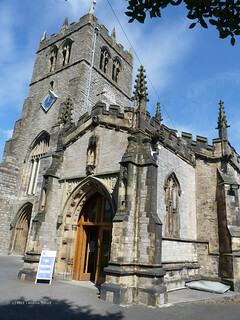 The second half of the open days began in the South Eastern corner of the branch, with Burton-in-Kendal and Milthorpe. 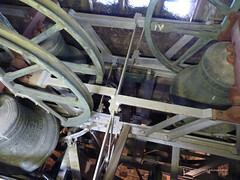 At Heversham a resident from a local care home ventured in to investigate, and was very appreciative of the bells. 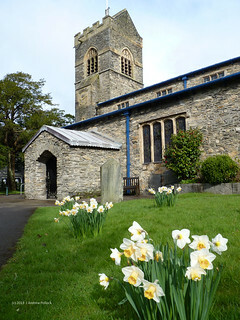 On my way to Cartmel, I paid a brief visit to the churchyard in Levens to see 3 steel bells cast by Naylor Vickers, and moved from Milnthorpe in 1912 and hung under a canopy. 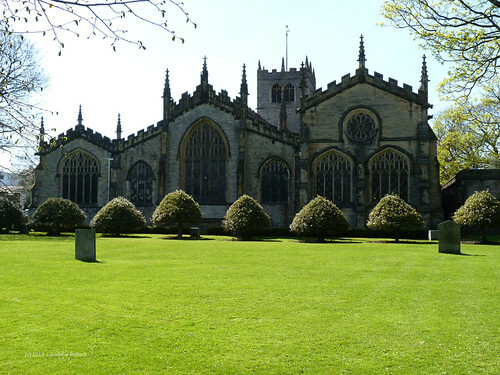 Cartmel Priory always takes my breath away, and it was good to see Sandie and Dai. 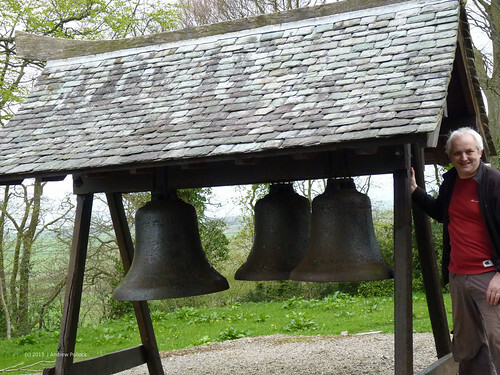 Andy Pollock stands beside the three bells that hang outside St John's church, Levens. 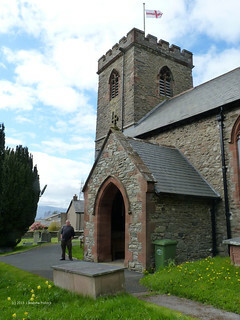 At Flookburgh, Jaap was amused by the amount of food that I had brought and needing setting up for the ringers lunch. After some frantic work and some sterling assistance from volunteers in the kitchen, a good spread was enjoyed by everyone. 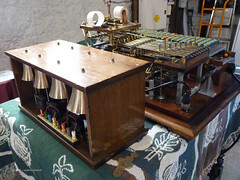 During the lunch break, some of the visitors went to see the curiosity that are the 10 tubular bells at Finsthwaite, and Chris Potts proudly showed off the recently refurbished tubular bells, and ably demonstrated the automatic chiming mechanism and playing by keyboard. Kendal sounded great, and some settled striking was enjoyable to listen to. 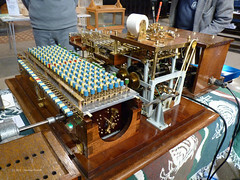 I was also fascinated by the intricate brass and complex movement of the Woodhouse Ringing Machine during Kevin’s excellent demonstration. 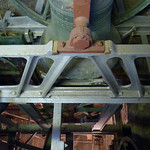 At Sedbergh I had an opportunity to follow Hilary up into the belfry and see the frame and bells stacked up the tower. 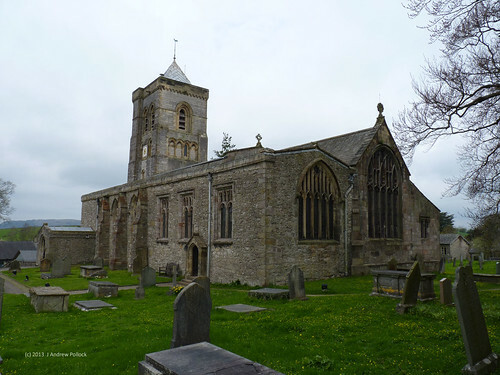 The final tower of the Open Weekend was Kirkby Stephen, where I was grateful to have a chance to ring the last ring (a plain course of Stedman triples). 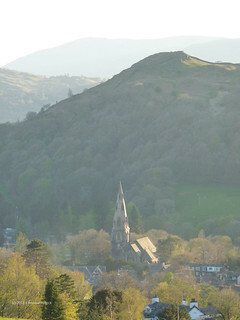 I considered joining a group of visitors for a grab at Appleby, but when they decided to head straight home, I decided to enjoy a leisurely drive through the middle of the Lake District in the evening sunshine, past Ullswater and over Kirkstone for a final grab at Ambleside's Monday evening practice, before heading past Hawkshead (in case they were still ringing) and home. Sunset over Lake District at the end of a very successful weekend that was hard-work to organise, but a lot of fun!